Yep Channing was there with his wife, Jenna-Dewan Tatum. Cute couple. And Josh Brolin was there with his fiancé. Didn't know he was engaged. And right PAN I had read Scarlett was filming and couldn't be there. And the Coen Brothers were there with ...... each other. Didn't see Frances in any pics. George and Amal were by far the stars of the red carpet. And they were a beautiful couple IMO. Amal has never shown any interest in giving interviews at these events. George has said as much. I think she is there to support her husband 100%. And she does look very comfortable in front of the cameras. She shows confidence and likes to smile. I don't see it as posing at all. The cameras are always all over the Clooneys wherever they are. Smiling sure beats the alternative. I hope Amal will be with George at the upcoming premieres! Anyone here going to see the movie this weekend? Way2Old4Dis wrote: I guess it's good that George's brain is still so awash in love pheromones that he apparently honestly believes that his wife is just "managing" to handle the fame and attention well, or that it's tough on her. She is now thisclose to doing the back-to-the-camera-pouty-look-over-the-shoulder movie star pose. Good for Amal , what is she supposed to do run screaming at an event for her husband that would have been rude. Channings wife posed as well under the sign so I assume they were asked. 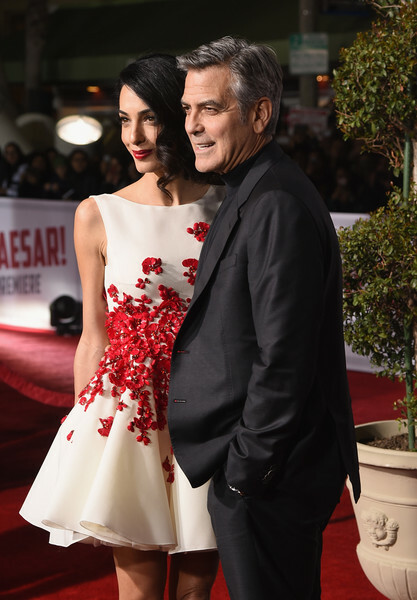 We are not privy to what kind of adjustment Amal has had to make in her life with George. If he says she has handled it well he should know he lives with her. It would frighten me to death to be there instead of Amal (except of the fact that she's there with the man we all love). So if Amal were like me she would stand there like a rabbit tgat's been driven into the corner by hunters, I couldn't smile or pose or anything like this. So why do we blame her for not disgracing her husband but supporting him? Is it a bad thing to like the spotlight? We've seen that they both try to fly under the radar quite often so I guess tgat's the compromise they have to make. I think Amal knew this was a big night for George and as a supportive wife did as asked and posed for pictures. ......actually, I think she found something in her wardrobe that matched the signage for the film. If you have to walk a huge red carpet at least you have to give yourself a boost and have a bit of a plan - apart from hanging on to the other half! At least she's not doing the teapot look pose! Pan what is the teapot pose? which of the many poses JLo does are you referring to? I hadn't seen the photos of the other cast members and their wives. Whenever the premiere is mentioned, pics of George and Amal come with it, not the others. Josh Brolin is the lead in this movie. Changing Tatum is a bigger box office draw than George and anyone else in the cast. Brolin's wife is his former assistant and an aspiring actress. Tatum's wife is an actress and dancer. Yet Amal, the attorney wife of the supporting actor, dominates the coverage of the red carpet. Sure, that can be chalked up to the Clooney fame and mystique, but it's not as if Mrs. Clooney can't exercise some discretionary control of her own. Is this the best way to "support" a movie that is technically NOT a 'George Clooney movie?' I don't think so. The appeal to the market is the tradition of success in Coen/Clooney collaborations. That should be the focus, not the length (or lack thereof) of his spouse's dress or the thinness of her legs. Take a few shots with your husband, then get out of the way. Let him, the actor, do the posing. They look perfect ,, everything about the Clooneys is interesting . Media focus on the smallest details,which sometimes cause a misunderstandings , Jenna was there but no one analyzed her dress or hair the way they did with Amal . Josh wife was there too . Way2Old4Dis wrote: I hadn't seen the photos of the other cast members and their wives. Whenever the premiere is mentioned, pics of George and Amal come with it, not the others. Who: Josh Brolin and George and Amal Clooney. What: The world premiere of Universal Picture’s Hail, Caesar!, written and directed by Ethan and Joel Coen. Where: Monday, February 1 at the Westwood Village Theatre. Why: Where else do you debut a film about a faux Hollywood studio but Hollywood? The film hits theaters on Friday, February 5. Wow: The main cast arrived in vintage autos for the movie (which is set in 1951). The filmmakers had a private dinner afterwards at Tavern. I don't know if she has a team by now or not, but I'm sure there are people who are advising her on how to handle these kinds of events. Maybe Cindy is giving her tips on how pose for the cameras. Maybe the Coen's asked George to take the lead at this premier. They know he's willing to play "mayor" and work the crowd and the press while the others can make a quick appearance and then get inside for the screening. Of course Amal gets coverage - she's with him. PAN - "I'm A Little Teapot"? Too funny! J-Lo has it down to a science. It's not whose fault? The Clooneys? Sure it is. The 'press' is just doing its job. George and Amal know what's in store. It's simple. Don't feed into it. Nobody wears a custom designer dress that short and then poses without the actual working actor unless the intent is to draw very specific and directed attention. there have been quite a few film premieres during the last weeks. Did any of them get so much medial attention as 'Hail Caesar'? And I think that it's mostly because of George. He promotes the hell out of every movie he's in and tries to support it as much as possible. Plus his wife now. Everybody wants to know what she's wearing, about her hair and make-up. And her cases get much more attention than nearly every other lawyer's. So they do get a lot of attention. If you just think about every time they went out in Italy last summer, the press coverage was enormous. George created the image of being the last real movie star, and now he's treated like one. The women around him always got a lot of attention and made a career in show biz (or at least tried to). About the premiere in detail: I saw quite some articles (just online up to now) where the other actors were mentioned and saw pictures of them PLUS their partners as well. And Amal wasn't with George all the time. I don't know if there was a life stream of the red carpet to check if she spent more time on the red carpet than the other actors partners, but she surely went inside the theatre when George and the other actors posed for pictures, did autographs etc. that's a great shot! I thought they maybe all came in the same car because George said they were in the car for just a very short time. So they had quite of these old cars, I really like them. Amal walked the carpet with George the women posed under the sign. When finished Amal with her body guard went into the theater to wait for George there is a video showing her going in. She is Georges wife this is a big event she was asked and posed. I think this is not the first time nor will it be the last time she is a big part of his life and he is proud of her and probably very happy that she is willing to be a part of these very public events. He said she doesn't want to do interviews. Agree carolhathaway and annemarie!. Amal does get a lot of attention. Goes with the territory. George has always gotten lots and lots of media attention. Can't avoid it when they are out ... alone or together. The media chooses to focus on them. It would not have mattered what length of dress she wore or who designed it. It could have been off the rack from Macy's. Doesn't matter. She and George attract attention. Amal shows a lot of poise when she is in the public eye at events with George. She has confidence and is comfortable having pictures taken of her. I don't understand why some think that's a bad thing??? The simplistic assumption to make is she wants and craves the attention. I'm of the opinion she's just knows how to handle it well. The Daily Mail posted lots of pics of G&A but there were a number of pics of the other stars of the film. Aren't they here? Carolhathaway I also found other media sites showing pics of the other stars attending the event. Way 2-- In the preview I saw, Brolin's name was before George's. I wasn't sure if they were in alphabetical order or not. So Brolin is the lead? Yeah From the reviews I read today George is a supporting role here. Donnamarie wrote: Agree carolhathaway and annemarie!. Amal does get a lot of attention. Goes with the territory. George has always gotten lots and lots of media attention. Can't avoid it when they are out ... alone or together. The media chooses to focus on them. It would not have mattered what length of dress she wore or who designed it. It could have been off the rack from Macy's. Doesn't matter. She and George attract attention. I'm not saying this makes her a "bad" person, but it does say to me she likes the attention or she would dial it back. IMO it's undeniable that she spends a lot of time and money on what she wears, and therefore is making this a priority in her busy life. Amal and George in the headline means plenty of clicks , and that's what the press is looking for , they are in the spotlight because of the sales . George and Amal never boring , they would just smile and it's a news . I think she loves fashion and looking good which a lot of women do not just ones with Amals finances. She has a busy life and I think fashion is her release she has to dress business professional when working so has fun and enjoys herself when not working. All women have different styles that is not a crime some prefer to dress quieter. I think Amals personality and spirit show in her clothes. She doesn't do interviews so we have no idea other than what George says about her. I also think we are forgetting one important thing if George was unhappy with the attention Amal gets I'm sure she would change the way she dresses. I think he loves the way she looks and is proud of her. Question: Were any of the other male cast members' wives at the premiere? Was Scarlett Johansson (sp?) there? Amal is the only woman that I've seen pictures of. As for George, he would have had to put on a Spandex tux and sequin tie to match Amal. His suit and turtleneck look fine to me. Last thing. She has thin legs. Not pretty. Thin. Plenty of women manage to show off their legs but show less of them. Just saying. there is an over the shoulder shot-Getty. Katie asked us not to post Getty. I'll try and find it for you and PM it to you. So sick of her not being a celebrity (LOLOLOLOL), I've tried to mentally block where I saw the photo. But, for you, Way 2,,, anything! I'm a little surprised that anyone would think that Amal's behaviour on the red carpet (where she wasn't for a very long time) is entirelly down to her. Does nobody think that she's right where George wants her, doing what he's asked her to do? If George wanted a quiet, supportive wife who was always in the background, that's exactly what he'd have. I thought we were past the days of the crazy woman on IMDb who claimed that Stacy Kiebler was sneaking onto the red carpet and posing for pictures with George against his will (because Kiebler was pretending to date George to get the publicity and he was just too polite to ask her to stop it). I'm not an Amal fan, but her choice of dress and behaviour is in line with what her husband is comfortable with. Yes katie and there is nothing wrong with that George would never marry a wall flower. He is out there being seen and any woman with him would have to be able to handle that . Whether Amal likes it or not is another matter just because she handles it well, what other option does she really have this is now a part of her life. Exactly. ALL of his partners have done the same thing and been on the red carpet with him, fully dressed to the nines, smiling (or smouting) for the cameras and posing for pictures as requested by the photographers. George is a good actor and a great movie star. There are great actors but they do not have the same charisma or wow factor as George in the "star" department. For instance Daniel Day-Lewis or Meryl Streep. Fantastic actors! I've read some descriptions of George as being almost iconic! I might argue that point but nonetheless George is major in Hollywood and the press love to follow him wherever he goes. This is his life and the woman he married has become part of that story. Especially since George had a reputation for decades of being the perennial bachelor! Thanks Katiedot for the pics. Love the first one especially under the Hail Caesar sign! The suit with the turtleneck. The square jaw. Handsome as ever! Yeah, I'm back to ignoring (her). Too much time on my hands yesterday. Hope the movie lives up to the hype. The response has been good so far. Fingers crossed that paying audiences agree. LizzyNY wrote: WWHS - If only they could read your post! She seems to have bought into the idea that 40 is the new 20 (which it is only if you have amazing genes and a plastic surgeon on call ). Maybe she's insecure when it comes to dressing for these public occasions, so she lets the designers or stylists make decisions for her. Either way, she needs to actually think about the impression she makes on the red carpet and stop listening to the media types- who would love nothing better than a wardrobe malfunction or crotch shot they could put all over the front page. I've noticed that when they're out together he usually dresses much more casually than she does. As if he doesn't have to try anymore because he's married now - and she overdresses because she has something to prove. One last thought. It seems that premiers have become a lot less formal than they used to be. It isn't just George who isn't all spiffed up. Not so much tuxes and gowns anymore - seems like almost anything goes. I think George will only wear a tux or a suit and tie when he absolutely has too. At every event that tie is the first thing to come off like a lot of men he hates them. I think the turtle neck was more for warmth he had to be out there for a while. but Katiedot is right. George Clooney is a big boy, has a definite type and never has a problem extricating himself from a relationship when he wants to go. Thank you PAN. I really enjoyed looking through these. thanks for the last photos (and for all the others as well). I was looking for the rabbit! where is? Old Alice in wonderland!